Strain Rate Imaging shows the filling phases of the left ventricle to consist of a wave of myocardial stretching, propagating from base to apex. The propagation velocity of the strain rate wave is reduced in delayed relaxation. This study examined the relation between the propagation velocity of strain rate in the myocardium and the propagation velocity of flow during early filling. 12 normal subjects and 13 patients with treated hypertension and normal systolic function were studied. Patients and controls differed significantly in diastolic early mitral flow measurements, peak early diastolic tissue velocity and peak early diastolic strain rate, showing delayed relaxation in the patient group. There were no significant differences in EF or diastolic diameter. Strain rate propagation velocity was reduced in the patient group while flow propagation velocity was increased. There was a negative correlation (R = -0.57) between strain rate propagation and deceleration time of the mitral flow E-wave (R = -0.51) and between strain rate propagation and flow propagation velocity and there was a positive correlation (R = 0.67) between the ratio between peak mitral flow velocity / strain rate propagation velocity and flow propagation velocity. The present study shows strain rate propagation to be a measure of filling time, but flow propagation to be a function of both flow velocity and strain rate propagation. Thus flow propagation is not a simple index of diastolic function in delayed relaxation. Strain rate imaging  is a spatial derivation of local velocity gradients: SR = Error!, subtracting translational velocities as well as the effects of adjacent segments (tethering) and giving information about the rate of regional deformation. The method has been validated for regional function against wall motion by echocardiography  and coronary angiography . Strain rate can be displayed in colour parametric imaging, where orange represents shortening, cyan to blue lengthening (Fig. 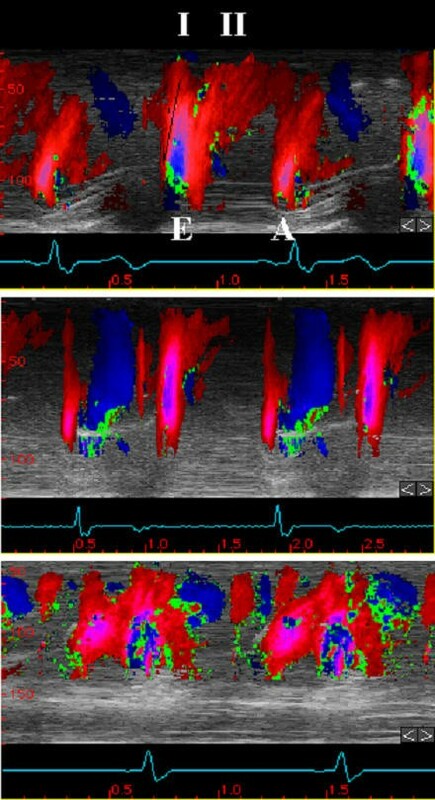 1) Temporal integration of strain rate results in strain, or a direct measurement of regional deformation – analogous to motion, and which have been validated against ultrasonomicrometry  and MR . By the breaking of velocities down to velocity gradients, it can be seen that some events are not simultaneous in all part of the ventricle, especially in diastole. The earliest event in diastole seen by this imaging modality is a protodiastolic lengthening of mid septum , followed by isovolumetric lengthening in the apex and then the early filling phase [6, 7]. Thus, the early filling phase is not the earliest diastolic event seen by this imaging modality. 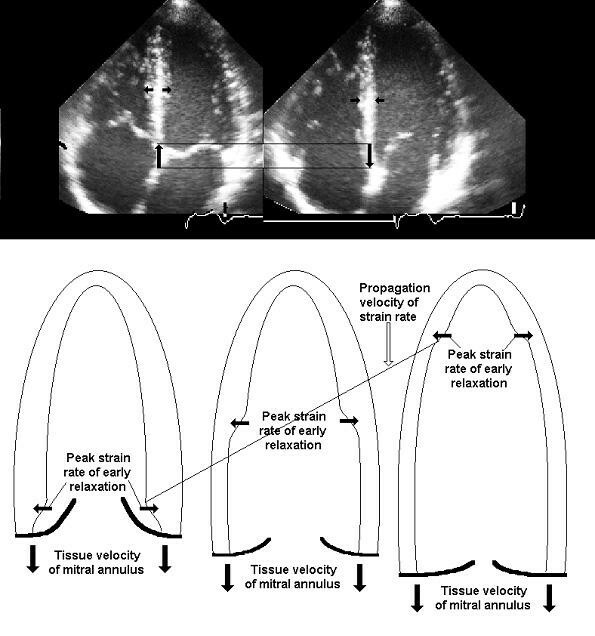 Early and late filling phases are seen as waves of stretching, propagating from the base to the apex of the ventricle (fig 1), with a measurable propagation velocity. Stretching is equivalent to simultaneous wall thinning  due to the incompressibility of heart muscle. The filling phases may thus be pictured as longitudinal events with simultaneous wall stretching and thinning and hence chamber dilation. Peak strain rate is then an index the rate of local wall thinning, and the annulus velocity is the resultant of both (fig. 2). The strain rate propagation velocity in early filling has been shown to be reduced in delayed relaxation  as well as being load dependent . Flow also propagates from the base to the apex during early filling. The flow propagation of early filling in normal ventricles has been shown to consist of an early phase of column propagation, followed by a later phase of vortex propagation . This is in oppositions to later computer simultations . Flow propagation have been shown to be reduced in diastolic dysfunction [11–13]. It is considered relatively load independent , although it has been shown to be chamber diameter dependent and thus influenced by dilation . Strain rate imaging from a normal subject. Top, still frames from systole showing yellow to red colours of negative strain rate (shortening), and early diastole showing blue to cyan colours of positive strain rate (lengthening). Periods of no strain are shown in green. The colour legend is reproduced to the left. A curved M-mode is placed in the septum. Below is shown the resulting M-mode from the same cine-loop of one heart cycle. The numbers to the left refers to the numbers on the 2D images, and are for orientation only. Systole (S) starts more or less simultaneous in all levels of the ventricle, while early filling (E) and atrial systole (A) can be seen as waves of stretching propagating from the base to the apex. The principle of propagation velocity measurement as the slope of ΔL/Δt is shown The ECG is shown at the bottom for reference. Strain in two dimensions. As heart muscle is incompressible, systolic shortening has to be balanced by simultaneous wall thickening, and diastolic stretching by thinning, as shown in the upper panel. As the wall gets thinner by diastolic stretching, the transverse diameter of the left ventricle increases. As the wall stretching (and hence thinning) propagates from the base to the apex, the early filling phase can be illustrated as a sequence as shown in the lower panel. The slope of the thin line across illustrates the strain rate propagation. As strain rate and strain rate propagation are the main indices of myocardial relaxation, they are considered the primary event, and flow propagation the secondary. The aim of this study was to compare the two measures, to establish the relation between them in normal and moderately reduced function, and to assess the influence of other diastolic measurements on flow propagation. 12 control subjects without any evidence of heart disease and 13 patients with hypertension were examined. Informed consent was obtained, and the investigation conformed with the principles outlined in the Declaration of Helsinki. The patients participated in the Losartan Intervention for Endpoint reduction in hypertension (LIFE) echo substudy , approved by the national ethical committee. They were selected to the LIFE study according to presence of ECG criteria for left ventricular hypertrophy, randomised to either losartan or atenolol in a blinded design, and additional antihypertensive medication of other types administered as needed. The echocardiographer was blinded to all treatment. Acquisition of additional SRI, tissue Doppler and colour flow data were done during scheduled control according to study protocol after 1 – 2 years of treatment. One patient had reduced global EF, moderate left ventricular dilation and reduced flow propagation velocity, but was not excluded in order not to introduce bias. Subject characteristics as well as basic echocardiographic measurements are summarised in table 1. The patients have preserved systolic function (apart from the one mentioned), moderate hypertrophy, and are significantly older than the controls. HR: heart rate, BP: blood pressure, EF: ejection fraction, IVSd: Septum thickness in diastole, LVDd: Left Ventricular diameter in diastole. A specially programmed system FiVe scanner (GE Vingmed Ultrasound, Horten, Norway) with a 2.5 MHz phased array transducer was employed. SRI was processed online on the scanner, and cine-loops of all three standard apical planes were recorded and transferred to a PC computer for analysis in a dedicated software. Frame rate was 70 – 100 FPS and offset length (strain rate sample volume) 5 – 7 mm. Linear propagation velocity of strain rate during early diastole (PVSe) was measured along the front of peak strain rate as shown in Fig 1, in all 6 walls of each ventricle, and averaged for each subject. Peak strain rate during early filling (SRe) was measured in all 16 standard segments  of the left ventricle and averaged for each subject. Standard echocardiographic recordings were acquired during the same examination and transferred to a Macintosh computer for off-line analysis in EchoPAC (GE Vingmed Ultrasound, Horten, Norway). Ejection Fraction (EF) was measured by modified biplane Simpson's method in apical 4-chamber and long-axis planes in the octave mode. Intraventricular septum thickness (IVSd) and left ventricular internal diameter (LVIDd) at end diastole were measured in parasternal M-mode. Mitral flow for measurement of deceleration time of early filling (dec.-t), peak transmitral flow velocity (E), peak flow velocity during atrial systole was acquired from a position between the tips of the mitral leaflets. Isovolumic relaxation time (IVR) was measured by pulsed Doppler in a position between aortic orifice and mitral inflow; valve click of aortic closure and start of mitral flow was used. 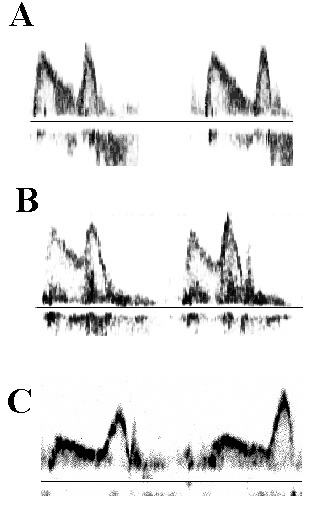 Colour M-mode of intraventricular flow was obtained with a pulse repetition frequency of 3 kHz, and flow propagation velocity during early filling (PVFe) was measured as shown in fig. 3. 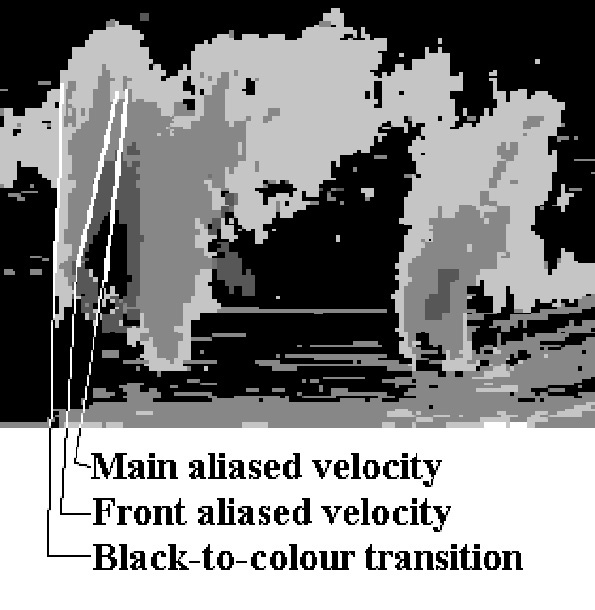 As the value of flow propagation depends on the method used: Black – to colour transition , front of first aliased contour  or main vector  as shown in fig 4, all three values was measured for comparison of results and variability. Peak velocity of the mitral annulus during early diastole (Ea) was measured by pulsed wave tissue Doppler at four points of the annulus and averaged for each subject. Flow propagation. Top: colour M-mode from normal subject. The picture shows early filling (E) and atrial systole (A). The two phases of early filling phase I or column propagation and phase II or vortex propagation described by Steen & Steen (12) are also visible. Measurement of column flow propagation as the slope ΔL/Δt is shown. Middle: from a patient with delayed relaxation with normal LV diameter and EF. High flow velocity propagation of phase I, evidenced by the upright column is seen. In addition there is very little phase II propagation, indicating a narrow ventricle during early filling. Bottom: from a patient with slightly dilated LV of 65 mm and EF of 45%. The main velocity propagation is phase II, vortex propagation with a low propagation velocity. Phase I is hardly discernible. Flow propagation measurement The slope of the line and thus the value for flow propagation is dependent on the contour chosen. P-values for differences between patients and controls are two-tailed probabilities by two-tailed student's T-test. All significant differences were also significant by Wilcoxon's two-sample rank sum test. Relation between flow propagation velocity (dependent) and various variables is by univariate and multiple linear regression. Correlations were by both Pearson's and Spearman's methods. Repeatability of flow propagation measurements was by Bland-Altman statistics. Diastolic measurements of flow, tissue Doppler and strain rate are shown in table 2. The main finding is that strain rate propagation is reduced, while flow propagation velocity is increased in the patient group, contrary to previous findings [11, 12]. Correspondingly there is a significant negative correlation between the two values: R = -0.57 (95% CI -0.23 to -0.79, p < 0.005, ρ = -0.54 p < 0.005). There was a significant negative correlation between strain rate propagation velocity and deceleration time of mitral flow: R = -0.51, (-0.15 to -0.75, p < 0.05, ρ= -0.48, p < 0.05). This is summarised in fig. 5. Scatterdiagram of values. A; strain rate propagation vs. flow propagation, showing the negative correlation. B; strain rate propagation vs. deceleration time. 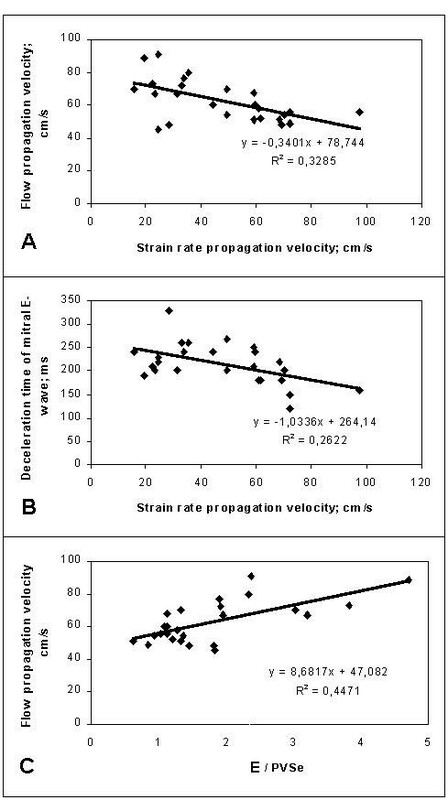 As strain rate propagation increases velocity filling time decreased. Bottom, ratio of peak early mitral flow velocity / strain rate propagation (E / PVSe) vs. flow propagation showing a positive correlation. E: Peak mitral flow velocity in early diastole. Dec-t: deceleration time of early transmitral flow. IVR: isovolumic relaxation time. E/A: ratio of early and late peak mitral flow. PVFe: Flow propagation velocity. Ea: Peak annulus velocity during early filling. SRe: Peak strain rate of early filling phase. PVSe: Strain rate propagation velocity. The patients show near normal peak mitral flow velocity, near normal, but still reduced E/A ratio compared to controls, and deceleration time of mitral flow velocity and IVR are prolonged in the patient group. Early diastolic annulus velocity and strain rate are reduced in the patient group, showing a moderate diastolic dysfunction. The ratio of mitral flow and annulus velocity, E/Ea was 5,4 in the control group, and 7.4 in the patient group, the difference is significant, but still indicates normal filling pressure in both groups . In univariate linear regression, only the correlation between strain rate propagation and flow propagation is significant (P = 0.003). No significant relation is found between flow propagation velocity and peak annular early diastolic velocity, left ventricular diastolic diameter, peak early diastolic strain rate, deceleration time of early mitral flow, isovolumic relaxation, HR, EF or age, in either univariate or multivariate analysis. Strain rate propagation velocity is significant in both univariate and multivariate (P = 0.004) analysis. Peak mitral flow velocity is not significant in univariate analysis, only in multivariate (P = 0.017), showing interaction with strain rate propagation velocity (Significance of the interaction: 0.014). Thus, there is a significant correlation between the ratio: peak early mitral flow velocity / strain rate propagation (E/PVSe) and flow propagation velocity, PVFe: R = 0.67, (0.37 – 0.84, p < 0.001, ρ = 0.58, p < 0.002). 95% limits of agreement for strain rate propagation velocity (Bland – Altman statistics; average difference ± 2SD of differences between repeated measurements) was (-29.4; 32.5 cm/s) by intraobserver and (-24.2; 36.6 cm/s) by interobserver study. In the present study, strain rate propagation velocity has standard error of the mean of 3.44 in controls, and 2.67 in patients, while flow propagation has standard error of 1.59 and 3.75 respectively. Flow propagation was measured in the same files with an interval of one year, by the same investigator. The intraobserver limits of agreement were (-33.3; 52.1 cm/s), showing a low precision. The difference between patients and controls, and the negative correlation with strain rate propagation velocity, however, remained significant. Comparison of three methods for measuring flow propagation is summarised in table 3, showing the front of aliased contour to give the best precision. P: significance of the differences between the two groups (Standard deviation in parentheses). R: Correlation with strain rate propagation velocity (95% confidence intervals in parentheses). Strain rate propagation is a measure of the rate of chamber expansion as illustrated in fig 1. Deceleration time of early mitral flow is a measure of filling time, and the negative correlation is as expected. Thus, strain rate propagation may be taken as a measure of left ventricular filling dynamics during early diastole. Flow propagation velocity and strain rate propagation velocity are similar in the control group. While strain rate propagation decreases in the patient group, consistent with delayed relaxation, flow propagation velocity increased. This finding is contrary to previous findings [11, 12, 14, 19–22], and unexpected in view of the reduced strain rate propagation, and the negative correlation between strain rate propagation and flow propagation velocity, is consistent with this finding. Measurements of propagation velocities have a low precision, as shown by the wide limits of agreements, and the variability given in table 3. This may account for the moderate strength of the correlation found. The actual value of flow propagation velocity depends on the method chosen, as shown in table 3 and fig. 4. In addition, measurements are dependent on scanner settings: Black-to-colour transition depends on the level of low velocity rejection, the aliasing contour on pulse repetition frequency. Comparing different studies is therefore difficult, as shown by the variety of normal values given, and also for methodological reasons, flow propagation velocity has limited value as an index of diastolic function . On the other hand, the low precision of flow propagation cannot explain the significance of the results, as low precision alone will result in random, rather than systematic variation. Previous studies have all shown reduced flow propagation velocity in reduced diastolic function. However, in many of those studies, there was simultaneous left ventricular dilation [9, 10, 17, 18]. It has been demonstrated that in left ventricular dilation, there is no column propagation, but solely vortex propagation, as the main mechanism for the flow propagation delay [14, 24]. In the present study, there was no left ventricular dilation (except in the one patient commented on), on the contrary, there was a non-significant trend toward a narrowing of the ventricle due to concentric hypertrophy. In addition slower strain rate propagation causes the ventricle to remain narrow for a longer time during early filling. Findings concerning reduced flow propagation in dilated ventricles will thus be irrelevant. However, also in ordinary ageing and in hypertrophic cardiomyopathy, where no dilation is to be expected, there is found delayed flow propagation [21, 22]. Thus, the characteristics of the patient group itself may be a factor in these results. The patient group is homogenous, with preserved systolic function and no chamber dilation. The patient group had delayed relaxation , as evidenced by the prolonged deceleration time and IVR as well as reduced early diastolic mitral annulus velocity by tissue Doppler. The E/A ratio but not the E flow velocity was reduced, but the pattern is more normal than in other studies . There was a significant difference in E/Ea ratio, but it was below the cut off value of 8 in both groups , so there was no indication of pseudonormalised mitral flow, although a difference in filling pressure within the normal range cannot be excluded. The main reason for the high early diastolic flow velocity seems thus to be very moderately reduced diastolic function. This may explain the discrepancy with previous studies. High early mitral flow velocity – i.e. the interaction with strain rate propagation velocity was shown to be a determining factor by multivariate analysis. A correlation between flow propagation velocity and the ratio of mitral flow velocity and strain rate propagation velocity; E/PVSe, will result in normal flow propagation in normals (fig 6a), increased flow propagation velocity in delayed relaxation with higher E velocity (6b) and reduced flow propagation in delayed relaxation with low E velocity (6c). Thus, there need not be any contradiction to findings in previous studies. Mitral flow patterns. A: Normal pattern. B: Prolonged deceleration time, but near normal E velocity and E/A ratio. C: Delayed relaxation with severely prolonged deceleration time, reduced E velocity and E/A ratio. Both in A and C, the flow propagation velocity may match strain rate propagation velocity, if the relation E/PVSe holds true. The reduced diastolic function in the patient group was due to a combination of age  and hypertension with moderate hypertrophy. This was considered acceptable, in view of the object of the study, the mechanics of filling, not causes of diastolic dysfunction. The function seems to be similar, irrespective of causes , but it still remains a limitation. Results will have no relevance in dilated ventricles, as they do not concern vortex propagation, nor to regional dysfunction where flow pattern is shown to be more complex due to regional disturbances . Strain Rate Imaging shows the ventricular deformation during early filling to be a dynamic event that is slowed in subjects with delayed relaxation. The strain rate propagation is the main determinant of the filling rate, and is consistent with filling time. 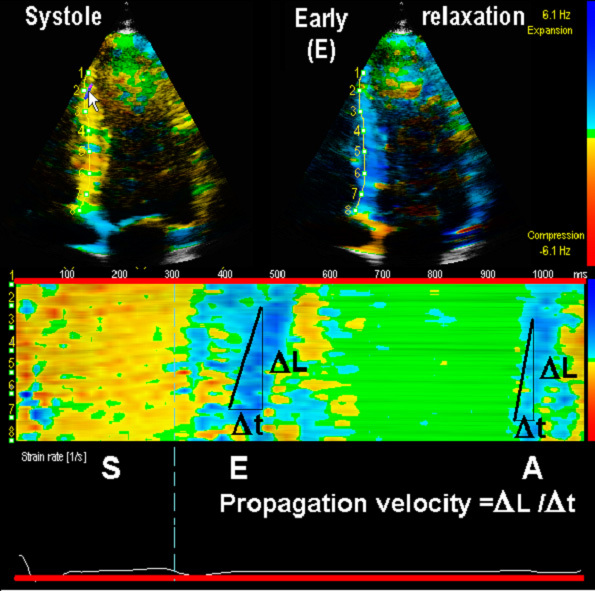 Flow propagation velocity, in this study, was found to be significantly increased in patients with delayed relaxation, and was shown to be dependent on both strain rate propagation and mitral inflow velocity, and is thus not a simple index of diastolic function. Neither strain rate propagation nor flow propagation velocities do at present show the precision necessary for clinical use. The study was supported by a grant from the Norwegian Council for Cardiovascular Disease. Björn Olstad, of GE Vingmed Ultrasound, Horten, Norway, programmed the special software for strain rate analysis. GS recruited the patients to the primary study, and referred them to the ultrasound sub study. AS did of the ultrasound recordings, analysis of echo recordings and data. TS was the project supervisor.